The Beretta M951 (aka, 1951) was the first real IDF standard issue handgun (insofar as the IDF uses handguns, which is rarely). You could make the argument that the Webley came before it, but the Webley was used more by the Haganah and other irregular forces prior to the IDF’s formation. Mine is a particularly interesting specimen – read on for more details. The Israelis used Beretta M951s as their de facto service pistol until they started buying Hi-Powers in the 1960’s (or so it seems). At that point, the two co-existed until the M951s wore out; the Israelis were infamous for putting +P+ Uzi ammo through M951s, which essentially destroyed the locking block. The Beretta M951 is a single-stack, single-action 9mm pistol. It’s all steel, and has a nice weighty feeling when you hold it. Very comfortable, too! This particular example has some pitting, probably from improper storage; it still shoots great. 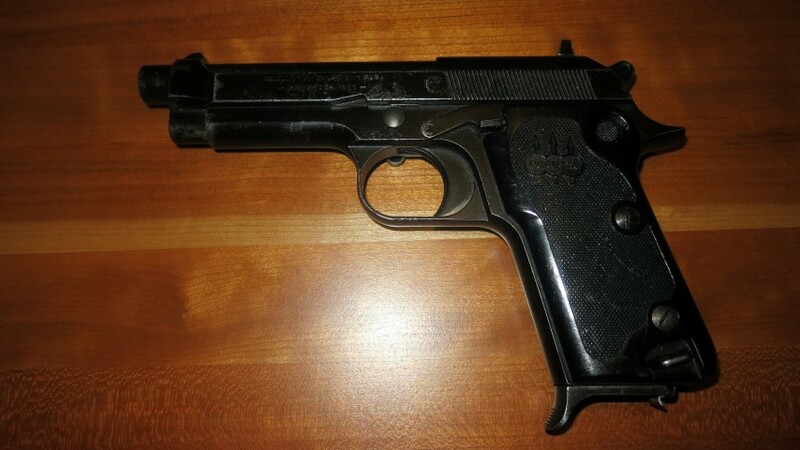 This particular pistol is a genuine Italian-made Egyptian contract pistol – not an Egyptian-made Helwan! The Egyptians put in a large order (50k) with Beretta for M951s to equip their army. These Egyptian contract pistols have some unique features – enlarged sights, a heel magazine release, and an Egyptian crest. You can see the crest near the slide serrations. You can see the date of manufacture on the slide – 1955. 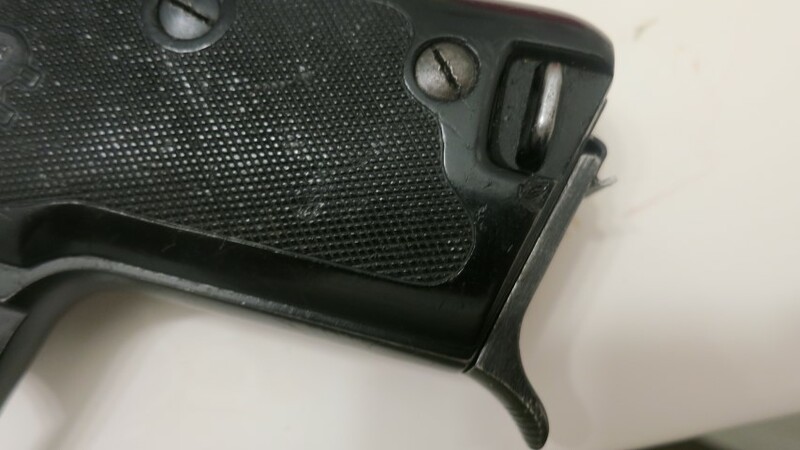 It amazes me that the Egyptians thought that this crude clip (barely visible at the back of the magazine) was somehow better than a proper magazine release button. You’d never be able to reload this thing in an emergency. And you’ve really got to love that old school lanyard ring. What really drew me to this particular example was when I saw the engraving pictured here. Translated: “To Chaim, In memory of our experiences of the war. Oct 73 Kalman Magen.” Many, many of the M951s in Israeli service were captured from the Egyptians in the various wars the Israelis fought with them (Suez Canal Crisis, Six Day War, Yom Kippur War, etc.). Presumably, this was a gift from General Kalman Magen to someone named Chaim, who I assume was a friend/family/subordinate. General Magen was the commander of the 252nd Armored division on the Egyptian front, so there’s historical evidence to support the theory. In any event, it’s a cool link back to a very desperate time in Israeli history. I really have no idea why something like this would be surplused, but I was happy to buy it. This pistol is a mixed blessing for me. It was a great curio & relics find, but is too historically valuable for me to shoot it. I suppose there are worse problems to have. Beautiful. I have a 1951 with IDF inspection marks that’s one of my favorite. Any idea from what period to what period the IDF used these? 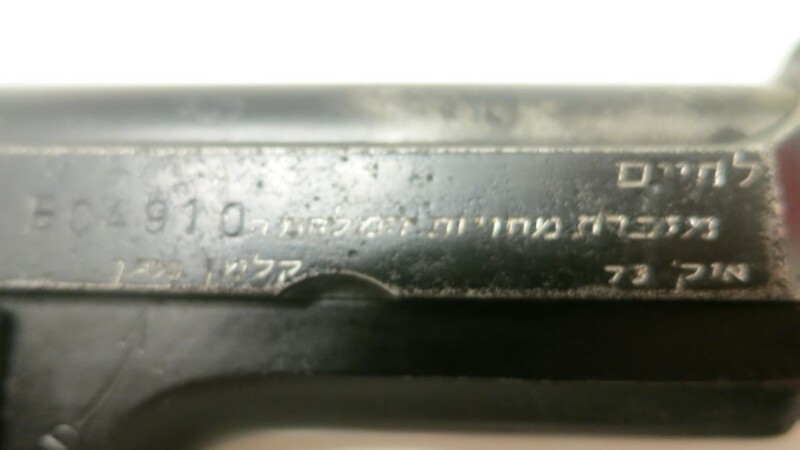 I have an IDF marked M1951. The frame is stamped with the Star of David and a property mark (truncated Kaf, somebody told me). The barrel is date stamped (74). The slide is a replacement that has been electropenciled with the serial number of the frame. The interesting thing is that the slide is dated 1991 (8 years after production stopped) and must have been replaced while still in Israeli service as it is also stamped with the same property mark. No idea. Got any pictures of the markings? It’s definitely hard to believe you’ve got a 1991 production M1951 slide, maybe it means something else. Sure, where can I post or send them for you? imgur link would be easiest, I think! Thanks! No idea what that is, Brother. Sorry. I can email them if you like. Great pictures. The Tzadi marking on them is the Tzahal acceptance stamp, so it’s probably an IDF gun. The slide is just weird, but the 1991 must be legit given the way it’s inscribed. The serial on it looks like a force match (ie, done after replacement). Maybe the IDF bought some spare parts or something? It’s hard to believe they would have factory refurbished them, given the BHP was in service by then. 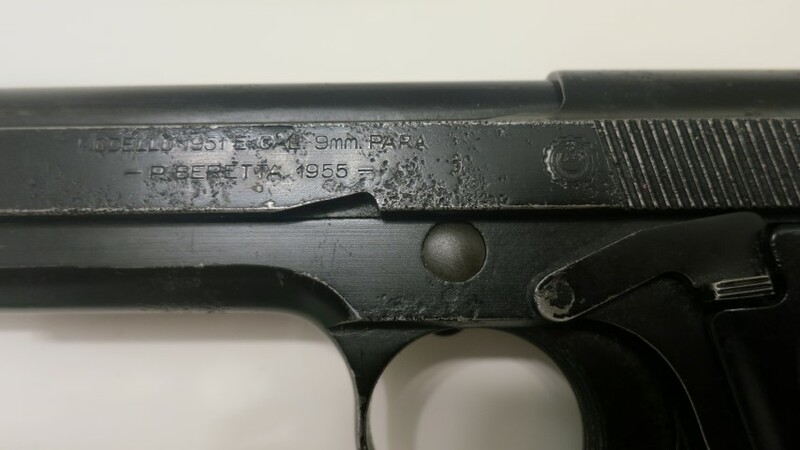 The IDF was infamous for blowing up M1951s with Uzi ammo, so it does make sense the slide would have been the part that failed. So maybe this is an IDF contract M1951 that got a new slide slapped on it. Thanks. I assume that the Tzahal acceptance mark is the star? What is the 2nd mark on the frame and slide? I wonder if they simply reassigned the 951’s to Police or Border Guard, when they had replaced them with BHP’s in the regular army? Beretta handgun is an awesome defence pistol for personal safety. It is good to know Israelis defence forces also used it before 1960. “insofar as the IDF uses handguns, which is rarely” – just like every other army in the world.